My journey to organic (semi)lifestyle started two years ago when we visited several Organic Farms in Bacolod. It opened my eyes to the benefits of eating and using organically grown products. Dr. Jo Albert of Rapha Valley Organic Farm opened our eyes to a lot of shocking facts about the food that we eat. Youtube power couple - Benji and Judy Travis (and their cute baby bears) also strengthened my belief for organic food/fruits. But of course, it is not easy for me to give up food like bacon and all the good stuff especially if we don't have access to organic products in the supermarket. So organic food is not always a choice for me, but more of preference. Imagine my excitement when I learned about the Organique Acai Premium Blend. It is an organic drink made of acai (pronounced ah-sah-ee) tree which is the tallest palm tree in Amazon jungle. Its small, dark purple berries have been a staple in the diet of the indigenous people of Brazil for centuries. It is said that the fruit helps relieve aches and pains. 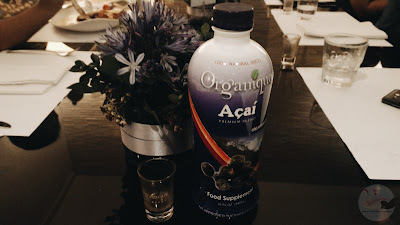 I started incorporating the Organique Acai Premium Blend in my daily diet and I was amazed by its effects. Organique Acai Premium Blend contains acai berry which is rich in antioxidants which combats cell damage. Basically, the body is replenished and strengthened everytime we take Organique Acai Premium Blend. It contains all the basic vitamins and minerals that our body needs and provides high dietary fiber. 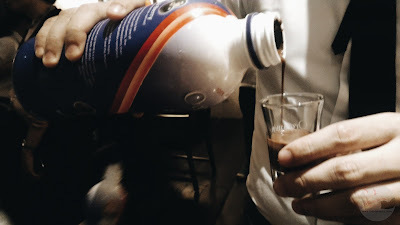 How to take Organique Acai Premium Blend? I take one jigger of Organique Acai Premium Blend as soon as I wake up. A replacement to my lemon water. After taking one shot, I drink one glass of lemon water to hydrate my body and after, that's when I drink coffee. The recommended dose of Organique Acai Premium Blend is 30-60 ml per day depending on the health condition. I heard that Regine Tolentino, dancer and fitness enthusiast doubles the dosage when she was having a hangover or not feeling well. You can guess, she felt great and light after. It is best to take the wonder drink on an empty stomach - pure with water. The taste is not so bad. It is like a pure smoothie. If you find the taste a bit repulsive, it is suggested to mix it with smoothie. For me, I like tasting it as it is. Review and Result of Organique Acai Premium Blend After 7 Days. On the first day of taking the Organique Acai Premium Blend, I felt like my body expelled all the toxins inside. I had really loose waste which came a few minutes after I took it in the morning. I continued using it for 7 days and I noticed it is always the case for me after taking it on an empty stomach. Surprisingly, I do not feel too hungry in between meals. On my third day, I noticed a lost on appetite (my mom is even surprised!). I always crave and snacking whenever I am home. But since I started taking Organique Acai, I could even skip a lunch or dinner. They say Organique Premium Blend can help lose weight, but that's not the goal for me so I still eat on time. The good thing is, the snacks in between were minimized. I also don't feel too acidic and it totally eliminated my "belching". Interestingly, when I have forgotten to take it one morning, I felt the symptoms of my gastritis once again. It seems that it does help the body recover daily. When I had my period this month, I didn't experience dysmenorrhea. The abdominal pain was still present but it is the kind that is tolerable. I always feel sick whenever I have period and I remember working from home or canceling commitments whenever I get my period. This month though, the pain is tolerable. Even TV host and wellness icon Cory Quirino advocates drinking of Organique Acai Premium Blend daily. She said it helps her keep young and energetic. Well, looks like she has found her fountain of youth. Who would have thought Ms. Cory is already on her 60s! I love the result of the Organique Premium Blend in my body but note that I have also incorporated a lot of juice and fruits in my diet during the first week using the drink. I take a glass of Oishi Great Lakes juice and gazillion servings of grapes. I have servings of grapes (roughly 10 to 15 pieces) after every meal and before going to bed. I plan to continue my Organique Acai Premium Blend morning ritual. My mom is also taking it every morning and we are hopeful this new wonder smoothie can help her ease body pain. Enhances muscle contractions and muscle regeneration which is good for recovery after physical work. Improves sexual health. Acai's anti-inflammatory and antioxidant properties can counter infertility due to stress, pollution and factors related to free radicals. A potent anti-aging food that keep cells operating optimally and may slow aging. May help prevent prostate enlargement. Help prevent osteoporosis for women. May help prevent heart diseases because of the antioxidant that decrease risk of vessel blockage. Help thwart retinopathy in diabetic people. Help prevent damage to DNA which lowers risk posed by carcinogens and mutagens. Aid vision with beta carotine and in Acai. Help maintain healthy teeth and gum. Better sleep as it relieves stress. Have you tried Organique Acai Premium Blend? Organique Acai Premium Blend is available in Mercury Drug, Pure Pharmacy, Robinson's Supermarket, Watson's and South Star Drug.